From critical traction in its nascent cloud business to successful hardware launches, here are the metrics and actions behind Alphabet's 2016. "2016 was simply a great year for us," said Alphabet (NASDAQ:GOOG) (NASDAQ:GOOGL) CFO Ruth Porat during the company's fourth-quarter earnings call. And it would be tough to argue with her. In 2016, Google parent Alphabet's revenue and profits increased, its core advertising business, non-advertising initiatives gained significant traction, and it wrapped up the year with two very successful Google-branded hardware launches. Here are eight facts to help capture Alphabet's business in 2016. Google offices. Image source: Alphabet. Total revenue increased 20% -- a notable acceleration from 14% year-over-year growth in 2015. And growth even picked up throughout 2016, with the company reporting 22% year-over-year growth in its fourth quarter, or 24% on a constant currency basis. GOOGL Revenue (Quarterly YoY Growth) data by YCharts. Alphabet cited mobile search, YouTube, and programmatic advertising as key revenue drivers during the year. Other bets revenue soared 82%, driven primarily by its smart home Nest products, Google Fiber internet, and Google's life science organization, Verily. Still, other bets remain unprofitable. Indeed, the segment, which only represents about 1% of Alphabet's total revenue, lost $2.9 billion in 2016 when excluding stock-based compensation -- and this loss was on just $809 million in revenue. Including stock-based compensation, other bets operating loss was a whopping $3.6 billion. Alphabet spent $3.7 billion repurchasing its own shares. As part of Alphabet's $7 billion repurchase program, the company's share repurchases in 2016 climbed higher. But investors shouldn't expect the share repurchase program to meaningfully reduce the company's shares outstanding, as Alphabet's stock-based award activities are almost just as aggressive. In 2016, Alphabet paid $3.3 billion in stock-based compensation. Other revenue increased 41%. Not to be confused with Alphabet's much smaller other bets segment, the company's other revenue, which is made up of non-advertising Google products, was driven primarily by Alphabet's Google Play app store, hardware sales, and cloud businesses. Alphabet introduced Waymo. Buried in Alphabet's other bets business, Alphabet's self-driving car technology development became a stand-alone business called Waymo. "Waymo may be a new company, but we're building on advanced self-driving technology developed over many years at Google," said Waymo chief executive John Krafcik in a December blog post. Alphabet intends for Waymo to commercialize self-driving vehicle hardware and software, aiming to dramatically improve road safety. In October, Alphabet launched a smart speaker and a smartphone. The company's voice-activated Google Home speaker and its new Google Pixel phone were clear successes this holiday season. While the company doesn't provide specific sales figures on the device, management did say it was "thrilled with the reception" for these devices, and that their success looks promising. Alphabet made significant progress in its cloud business. Management said in the company's fourth-quarter earnings call that its cloud business is on a "terrific upswing." With the help of Alphabet's well-timed $625 million acquisition of API provider Apigee, Alphabet made particular progress differentiating its Google Cloud Platform (GCP) by sharpening its offerings in data analytics, machine learning, security, and tools for application development. Further, in 2016, Alphabet's Google Cloud's G Suite product, which offers cloud-based collaboration and productivity applications, garnered more than three million paying customers by the end of the year. Going into 2017, Alphabet will be up against a strong benchmark: itself. With a tough year-over-year comparison of 20% revenue growth in 2016, the company will need to continue executing well across Google advertising and YouTube, as well as its smaller businesses like hardware and cloud. 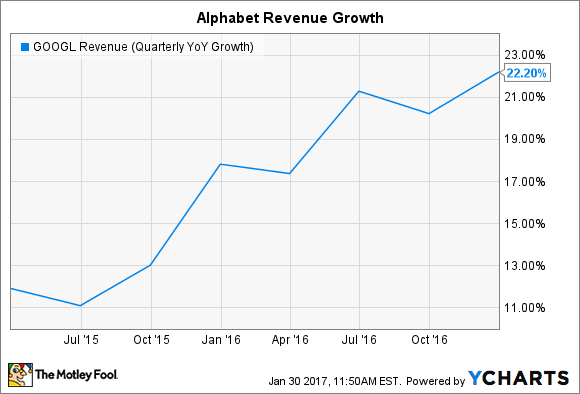 Further, while Alphabet's other bets are still too small to help overall revenue growth in 2017, investors should continue to look for promising signs from the segment this year. Editor's note: a previous version of this article misidentified Alphabet's CFO Ruth Porat.